Teacher Kathy Rodgers helps with a class assignment. When I was about twelve, I started thinking about college. I was not sure of much, but I knew I wanted to go far, possibly even outside the country. My mom has a few friends who live in California and the school their kids go to offers the International Baccalaureate diploma. I first heard of it over the phone when I was in seventh grade. I looked it up and was drawn into the information I found. The idea of having six subjects and having an equal balance in each interested me. At first, I worried about the arts, but I figured out that I could double in a subject to replace it. After thinking about it for a couple of months, I talked to my mom about my findings. I was really interested in getting this diploma. I was convinced it would make me a better student and wanted the opportunity to engage in this deeper level thinking. She gave me the green light to go ahead and research schools. That’s actually how I found George School. When I got here, I was not sure what would happen. I did not know if I would change my mind and drop the IB idea. But two years later, I am a likely IB candidate. I plan to take two standard level exams, Spanish and Economics, and four higher level exams, English, Latin, Math, and Biology. The rest of my classes are a sprinkling of APs. I am doubling in language and not taking an art. I know this is going to be very difficult, but I am prepared. The IB diploma is something I have been working towards for three years now. I love the thought of learning to think critically. I am anxious for a chance to write essays of deeper level thinking. I want to learn, but I don’t want to focus in one subject. I want to be a well-rounded academic and I feel like IB offers me more resources to do that. This year George School students will be participating in a number of service trips throughout the world. This spring trips traveled to France, Mississippi, Nicaragua, South Africa, and Washington, DC. In just a few days several more groups will embark on their trips to Arizona, China, and Cuba. More information about each trip is below. Students work as teachers’ aides in the Kayenta Elementary School located in the Navajo Nation of Arizona. Homestays with local families provide the opportunity to experience the daily life and culture in the Navajo Nation. After-school activities for George School students might include horseback riding through Monument Valley, camping out on the Black Mesa, or rafting down the Colorado River. The service project in Yangzhou China will focus on both service and Mandarin Chinese language. Students will stay with Chinese host families that have a student who attends Yangzhou high school, the leading high school in Yangzhou. Students will attend some classes with their hosts and attend culture classes. Service projects will be at a migrant workers’ children’s school, a special needs school, and an orphanage. George School students will help in the major reconstruction of a church in Holguin. Plans also include working in an urban hydroponic garden and visiting a community orphanage and a school for the blind and deaf. Students may visit the city of Santiago, the Quaker community in Gibara, the historic town of Bayamo, and the beach at Guardalavaca. Nancy and Jack Starmer pose at the end of an All-School Assembly in honor of Nancy. 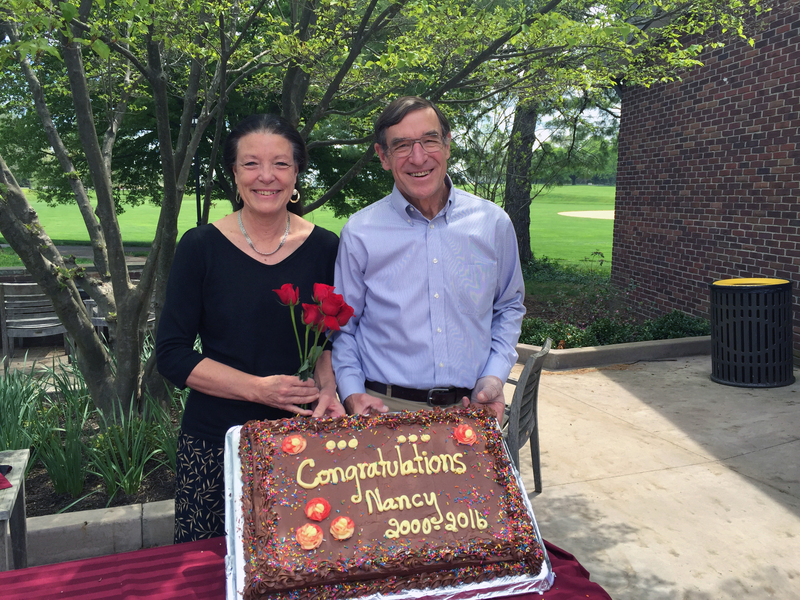 Below is the transcript of a speech given by Ralph Lelii, International Baccalaureate (IB) program director, English teacher, and Theory of Knowledge teacher at the All-Alumni Gathering celebrating Nancy Starmer during Alumni Weekend. This morning I was awakened by the combined sounds of a crowing rooster and blaring Spanish music from a neighboring house. Since I woke up earlier than usual, I decided to help my host mom with the household chores she does every morning before she walked me to breakfast at Rafaela´s. As part of our experience with YSOP, we heard from Alan, a formerly homeless man who once had a life to which many would aspire. Alan’s story was inspiring, but the most important thing that Alan told us was that homeless people need to be treated like humans. Of course, I have always known this; however, I get caught up in the discomfort that homeless people can sometimes bring me. This discomfort denies them their right to be treated like humans. Alan told us that his best moment as a homeless person occurred when a woman asked him his name and took the time to talk to him. I felt horrible after hearing this. I realized how humiliating it must be to be ignored by person after person, when all you are trying to do is simply survive. I realized that I need to treat homeless people better. I wouldn’t ignore any of my peers or teachers, so there is no reason I should ignore a homeless person when they ask me how I am or ask me for a dollar. All white people are racist.